This post is sponsored by Plant Therapy. 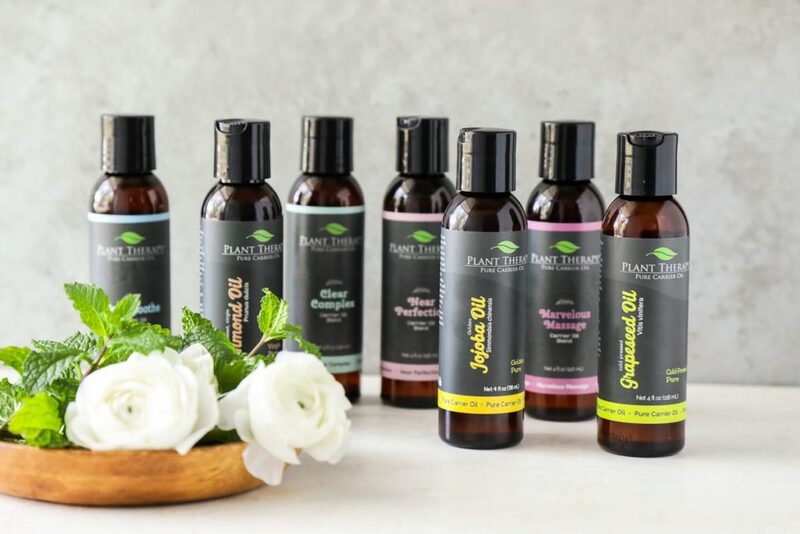 Thank you Plant Therapy for helping me get the word out about using natural ingredients, like essential oils and butters, to create a natural body-care routine. First, we made this ultra-moisturizing lotion, which is really a body butter, but I used it as a body lotion–hence the name. 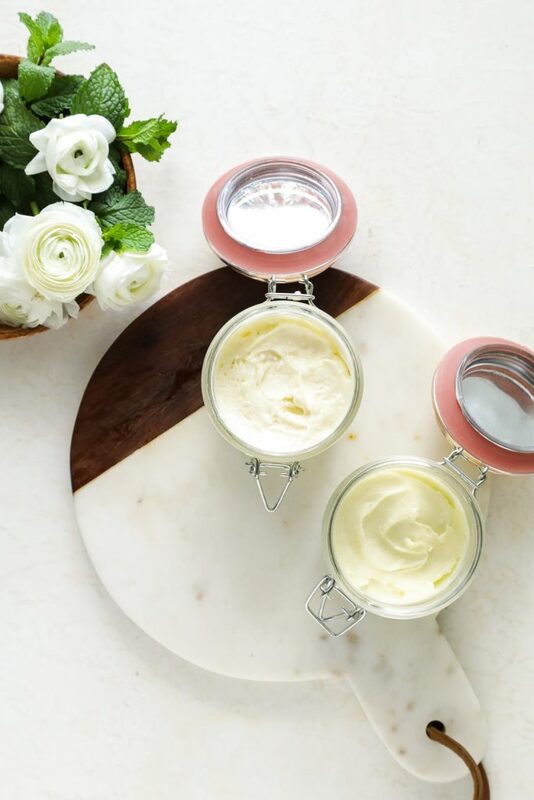 Then, just last week, we returned to the kitchen to make a quick and simple shea butter cream moisturizer, which is also a body butter–or a face butter since that’s my preferred way to use it. Think of today’s post as a crash course in body butter. My goal is to give you practical and simple tools to create a homemade body butter that works for your skin, budget, and scent preferences. I had never heard of body butter until just a few years ago, when a friend introduced me to her favorite skincare butter. I remember thinking, Body butter? Why in the world would you want to slather butter on your body? My curiosity was piqued, so I began to research this new-to-me product. After some research, I discovered that body butter is a rich and moisturizing skincare product that’s generally made with skincare butters, like shea butter and cocoa butter. Body butter can be used as an alternative to lotion, since its primary job is to moisturize the skin. Lotion is made with water and oil (and possibly butters) so it’s light and silky smooth. Body butter, on the other hand, is made exclusively with butter(s) and oil(s), so it’s very thick. The final products are used in the same way, to moisturize the skin, but they’re made with different ingredients, using different methods. From a do-it-yourself standpoint, homemade body butter will last for months without the use of a preservative. 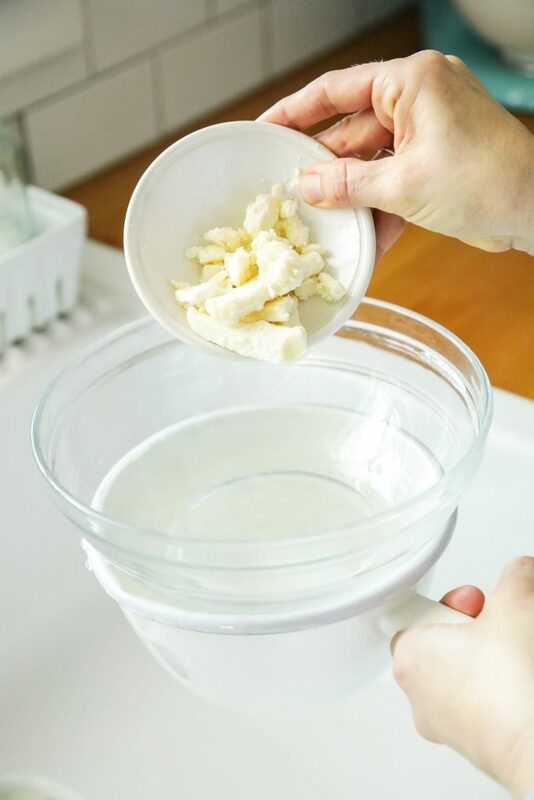 Homemade lotion needs to be used within a short time frame or a preservative should be used (thanks to the water), and it requires an emulsifier to properly blend the oil and water together. 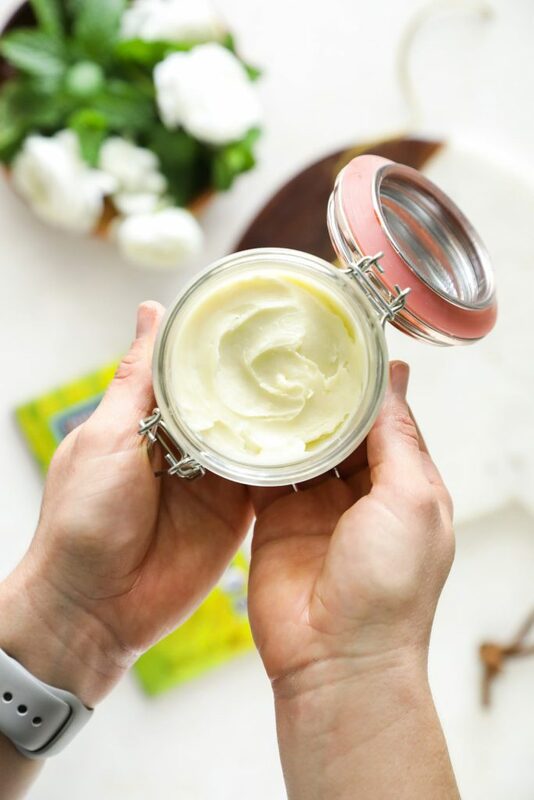 Technically, body butter is recommended for folks who need intense moisture, but I’ve personally found that it’s a great lotion alternative–no super dry skin needed. 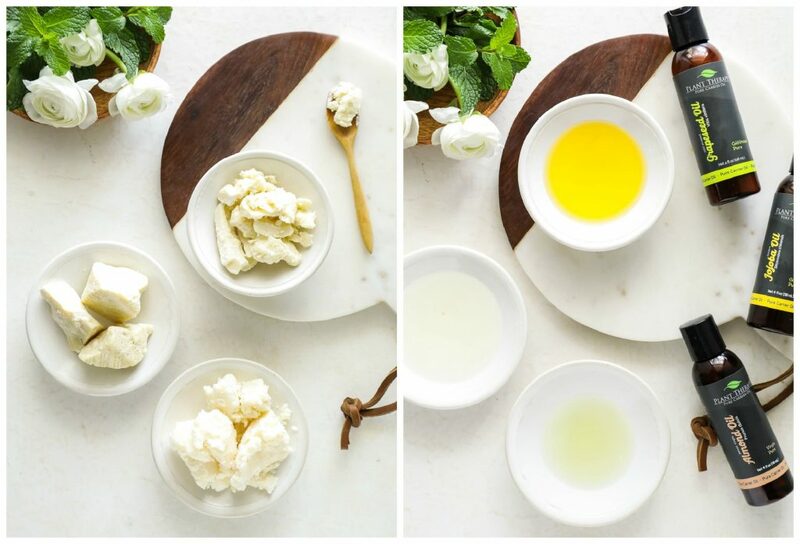 The beauty of body butter is that once you have a simple formula/recipe, it’s easy to customize a butter to your liking. Homemade body butter starts with butter. I’ve found that shea butter is the perfect base butter, since it’s soft and easy to work with. My homemade formula calls for a 1/4 cup of shea butter as the base butter. From there, it’s up to you, the maker, to customize the body butter. You’ll need a total of 1/2 cup butter, so you can either double the shea (for a total of 1/2 cup), or mix the shea with a different butter: 1/4 cup of cocoa butter or 1/4 cup of mango butter. Shea Butter: Shea butter comes from the “nut” (or pit) of the fruit found on the Karite Tree. It has a strong scent when it’s purchased in an unrefined state. I use unrefined/crude shea butter in recipes (including body butter), but if you don’t care for the (natural) fragrance, I recommend using refined shea butter. 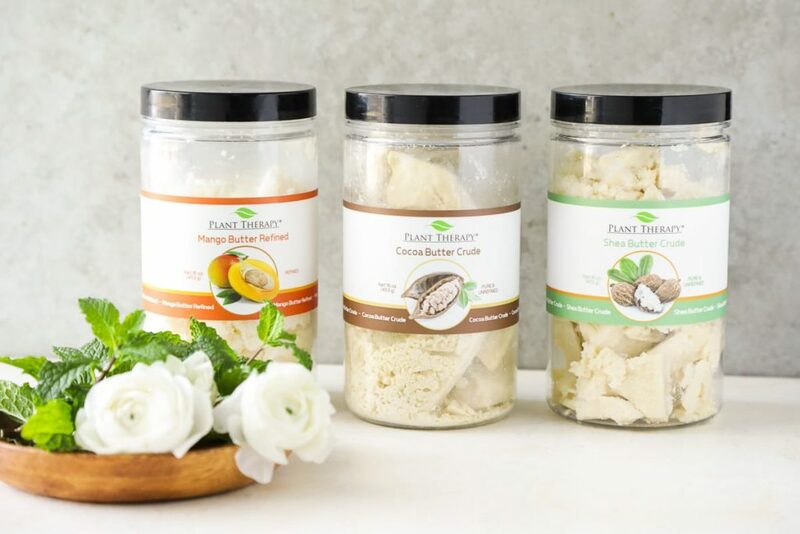 Since shea butter is naturally soft, it can be used as the main ingredient in body butter, or it may be combined with another butter–cocoa or mango butter–to create a custom body butter. Cocoa Butter: Cocoa butter comes from the cocoa bean, so it smells like chocolate. Cocoa butter is hard, at room temperature, and it melts easily. I don’t recommend making a 100% cocoa butter body butter because you’ll end up with a final product that’s solid as a rock. Cocoa butter must be mixed with a softer butter, like shea or mango butter, to yield a soft and spreadable final product. Mango Butter: Mango butter comes from the seed of mango fruit. It’s a soft butter, similar to shea butter, that can have a bit of a gritty texture before it’s melted down to create body butter. If you don’t want to use shea butter to make body butter, then mango butter is the best replacement. Mango butter may be combined with shea or cocoa butter to create a custom body butter. Oil is the second main ingredient used to make body butter. The oils used in skincare recipes are typically referred to as carrier oils, although I usually call them nourishing oils. The oil used is completely up to you. For my body, I usually stick with almond or jojoba oil, and just started playing around with grapeseed oil. Virgin coconut oil may also be used; it’s just not my personal preference. Another option is to use a carrier oil blend. I particularly like this option for making a butter used on my face. I’ve been using Clear Complex with shea butter (find the recipe here), and absolutely love it. Other carrier oil blends, include: Near Perfection and Younger Glo. Some folks find that body butter is a bit too greasy to apply all over the body. The good news is that there’s a simple solution for this issue…arrowroot flour/starch. A small amount of arrowroot flour/starch may be added to the liquid oil before pouring the oil into the melted butter(s). Finally, an essential oil may be added for scent and additional skincare benefits. At the moment, my personal favorites are: lavender, geranium, and frankincense (Carteri). Another option is to use a pre-blended synergy, like: Love Vanilla, Soft Skin, or Tranquil. I use a 1% dilution in my body butter. Before using any essential oil, I recommend reading the back of the bottle for specific dilution recommendations–just to be safe. 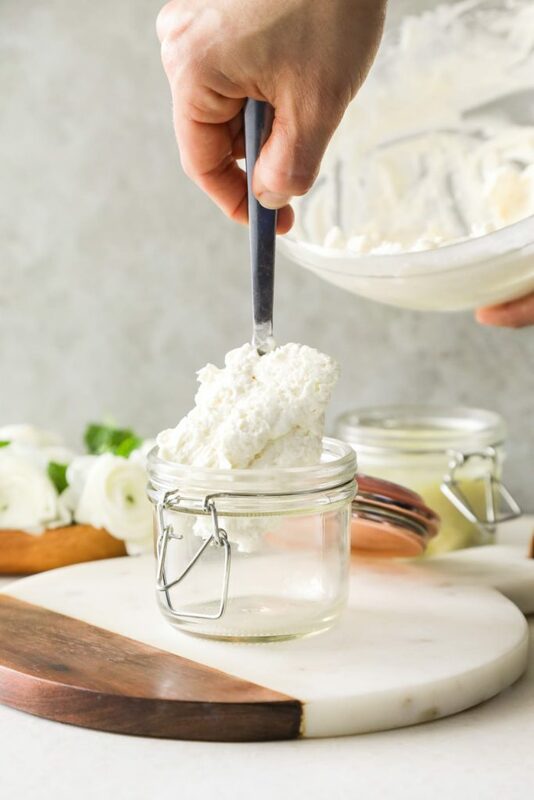 Now that we’ve touched on the basics of body butter, let’s take a look at my formula for making your own custom body butter. 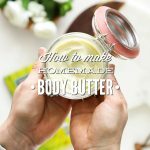 Simple, homemade, and customizable body butter that leaves the skin naturally-nourished and moisturized. Place a glass bowl on top of a saucepan partially filled with water over medium heat. Place the butters in the glass bowl, and allow them to fully melt. If you're planning to use arrowroot flour in your body butter, in a small bowl, whisk the flour into the carrier oil. Set the mixture aside. If you're not using arrowroot flour, skip this step. Carefully remove the bowl (and melted butters) from the heat source. Add the oil (with the arrowroot flour, if using), and stir to combine the ingredients. At this point, the oil mixture should be cooler (along with the bowl). If not, allow it to rest for a few minutes. Then place the mixture in the fridge and allow it to solidify (about 30 minutes to 1 hour, depending on location in the fridge and fridge temperature). Once the mixture is opaque and a bit firm (not solid as a rock), remove the bowl from the fridge. Add the essential oil of choice, if desired. If you used cocoa butter in your body butter, then whisk the mixture with a fork until it appears "whipped." 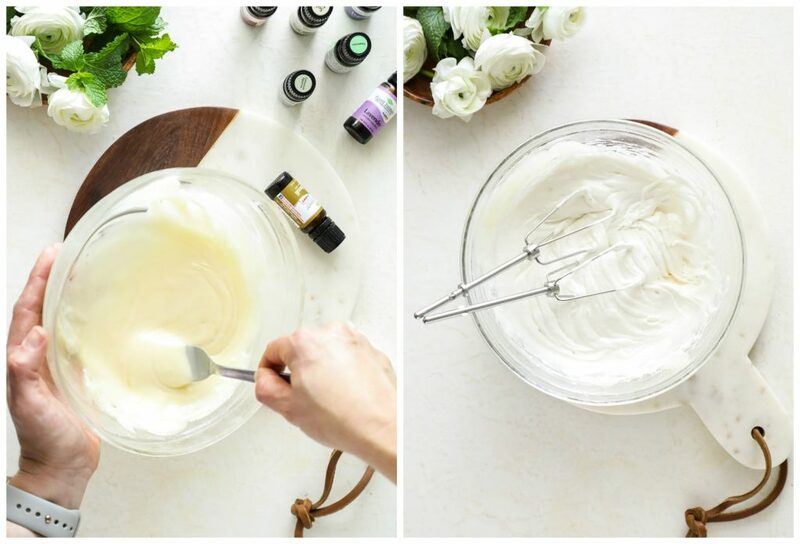 If you used shea and/or mango butters in your body butter, then you can use the same technique with a fork, or use a stand mixer to "whip" the mixture. Scoop the body butter into a jar with a lid. Place the lid on the jar. Store the body butter at room temperature (out of sunlight). This mixture should last about six months, if bacteria isn't introduced to the mixture via dirty hands. After bathing, apply a small amount of body butter to your fingertips, and then massage the butter on your skin/body. Apply as needed. *Mango butter will yield a softer body butter. Cocoa butter will yield a thicker body butter that smells a bit like chocolate. You can also use shea butter again, if desired, instead of using mango or cocoa butter. **I like sweet almond oil, jojoba oil, or grapeseed oil. ***If you're concerned about the final product feeling too greasy, then I recommend adding this optional ingredient. The arrowroot cuts through the greasy feel that's often associated with body butter. ****My personal favorites: lavender, geranium (Egyptian), frankincense (Carteri). Another option is to use a pre-blended synergy, like: Love Vanilla (my favorite), Soft Skin, or Tranquil. I use a 1% dilution in my body butter. Before using any essential oil, I recommend reading the back of the bottle for specific dilution recommendations--just to be safe. When I first discovered Plant Therapy (a few years ago), I was so impressed with the company as a whole: the commitment to safe essential oil education and the quality of the essential oils and affordable prices. Plant Therapy quickly became one of my go-to brands for essential oils. Since that time, they’ve grown as a company and expanded their product lines, while still keeping the same passion and commitment to quality and affordable pricing. I love that I can now source high quality butters (which come in fantastic storage containers), beeswax, essential oils (as well as information on how to use the oils), and carrier (nourishing) oils from Plant Therapy. Finally a body butter that actually FEELS like butter! After months of trying many many recipes, this one has they key! It’s so important (if you want soft yet thick consistency) to let the mixture cool completely before using a hand or stand mixer. Step #5 is absolutely not to be skipped. Mine had to stay in back of fridge for 35 min to get completely opaque with no more liquid center. It was not hard as a rock but it’s definitely solid. Then it whips perfectly into a butter like consistency. Adding arrowroot is essential as well for silky feel. But adding it exactly as described in step #2 makes a HUGE difference as compared to adding it into the solid mixture during the whipping phase. For some reason whisking into carrier oil first allows it to absorb perfectly. Thank you so much for this gorgeous body butter! I love the idea of making my own body butter (and all other body products as well) but I hate the greasiness of most DIY body butter/lotions. I ha e never heard about adding arrowroot to the mixture to cut the greasiness. I’m so excited to try this recipe out! Thank you, Juli! I’m so glad the post was helpful. The arrowroot definitely makes a huge difference. This particular post was sponsored by Plant Therapy, so I collaborated with them on the post–and since they provided the products, I’ve linked to the products used. It’s very rare for me to partner with a specific company, but I love PT and use their products and so it’s a very natural fit here. For other posts, many folks ask for the specific products I use (the brands), so that’s why I link to them, but don’t usually mention specific brands–unless necessary. Usually I’ll list, “shea butter” and also provide a link to the brand used. I don’t have to link to the brands I’m using, but many times people ask for them. I’ve found this helps people who don’t know what to look for have a good reference. For some links (Amazon), we earn a commission (at no extra cost to a reader), although that’s just a small by-product and not the main reason for using those links. Since we provide free recipes on the site, but the cost to maintain a website our size is very very expensive (buying supplies for making and testing recipes, paying for website hosting and email service, etc.) this is a great way to support the expenses on the blog while also providing helpful information for readers. Thanks so much for the reply and that is good to know! I like that the companies that sponsor you will give you a commission if we go to their site from yours. I will try to remember to link straight there from the recipe if I need something. And I do, also, like knowing what you’ve tried and which companies work for you. Thanks so much. I’m so glad the explanation was helpful, Juli! Thank you :). PS!!! Thanks so much for the arrowroot tip! 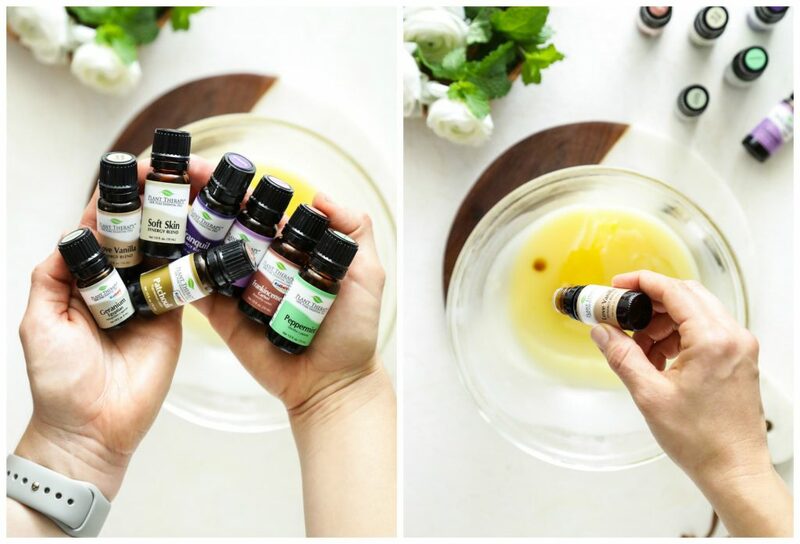 I didn’t know that and am constantly dealing with oil all over EVERYTHING because of the dry skin problems I’ve been dealing with the past year that nothing but oils will relieve…. I’m looking to try this but do not have arrow root powder, could something else be used? Hey Christy, I wonder if cornstarch would work the same way? I’m not sure, but it’s the closet substitution I can think of. arrowroot, cream of tartar and tapioca flour can all be used in other recipes as substitutes for each other so i would guess it should work. However, i have one problem and i ask your advice, you prepared hundreds of recipes and you have a lot of experience. My question is why some of the creams or body butters start to crystallize? Even this one, It has a texture like a crystallized honey ( grainy, sandy type). Actually,it turns into very small sugar granules. Why this is happening? What i have done wrong? I would appreciate so much your answer. Thank you very much. Hey Avram, That can happen with shea butter when it cools slowly. If the issue continues, I recommend rapidly cooling the final product, once everything is mixed together. This should prevent the shea butter from turning into a grainy final product. Here’s an example of the method: https://livesimply.me/2016/11/04/cooling-honey-lip-balm/. Mine is cooling. I’ll be adding ginger essential oil hoping to duplicate Origins Ginger body butter, which I can’t afford, but love! Funny story, I was visiting a friend in Texas who had a bag of arrowroot and wanted me to take some home in a zip bag. I could just see TSA officials at the airport as I tried to explain what it was and wasn’t!! My local health food store had it in bulk and I bought a small container full. Thanks for all the fun recipes. I’ll be making some of the other personal care products. Lol, Phyllis, I’ve thought the same thing about a few natural ingredients and going through TSA ;). I love that you’re using ginger essential oil–sounds amazing! Let me know how it turns out with the ginger. Hi Kristin! I’m allergic to shea and mango, but was wondering if this would work with Cocoa Butter + Avocado Butter? I just discovered your blog the other day during a desperate search for hypoallergenic skin products after another allergic reaction to a facial cleanser and I am so excited about making my own products. I have such sensitive skin and I’m allergic to so many nuts and even some preservatives which makes it extremely difficult to buy organic AND synthetic skin care products! It’s such a relief to have guidance on how to make moisturizers, cleansers, and toners that I KNOW all the ingredients in. Hey Megan, I’ve never tried avocado butter before. As long as it’s a softer butter, I think it should work. Cocoa butter alone (well, along with the oil) results in a very hard body butter. Let me know if you try it! And now I need to find myself some avocado butter so I can play around with using it! Where did you find that jar with the pink gasket? Hey Denise, I found this jar at Target! 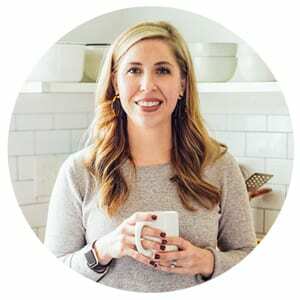 Hi Kristin, great recipe! I was wondering why you didn’t use Beeswax in your recipes? I see it in other recipes. Thank you so much! Hey Liz, I’ve found that beeswax creates a very stiff/hard body butter. I personally don’t care for the texture when beeswax is added. Thank you :). Thank you so much for replying! I will be trying this recipe along with the facial moisturizer! I’m wanting to buy unrefined cocoa butter is PURE cocoa butter the same??? Hey Robin, I want to say yes, because usually cocoa butter is unrefined cocoa butter, from my buying experience. I would search around on Amazon, too, and see what you can find and compare product descriptions. You could also reach out to Plant Therapy via their site. Hi there! I made your recipe but used tapioca starch as that was all I had and it was so soft yesterday. I didn’t add oils as I didn’t have them. But this morning it was solid as a rock and I don’t know why. Any advice? Hey Jennifer, Body butter is a harder moisturizing product than a water-based lotion, but it shouldn’t be so hard that you can’t get it out of the jar. Here’s my initial thought… Did you skip the carrier/nourishing oil or essential oil? If butter alone was used, that would be the cause for the hard product. The body butter needs the carrier/nourishing oil to create a softer product. The essential oil can be skipped. If a carrier oil was used, what butter was used, or combo of butters? I used Shea and Kokum butter and grape seed oil as a carrier oil. I did omit the essential oils. Hey Jennifer, Hmmm, I’ve never used kokum butter, so I’m not sure how it cools and sets (cocoa butter will produce a harder body butter, shea butter and mango butter will produce a softer butter). It could just be the butter results in a slightly harder body butter. Body butter is hard versus a fluffy, soft product, but it should go on effortlessly when it comes in contact with the skin (and it should easily scoop from the jar with your fingers). Hello! How much vegetable glycerin would you suggest I add to this recipe? Thank you! Hey Lindsay, I wouldn’t add any to a body butter. Dear Kristin you recipes are super…. I am a beginner in the world of homemade and organic cosmetics, your blog is very inspirational. I ad been wondering what can I used in place of arrowroot flour? do you have any recommendations.. Thank you, you could use cornstarch instead. Hey Ianne, The shelf life is 6-12 months, depending on the nourishing/carrier oil used. Hey Grace, You could skip the heating portion if you’re using all shea butter for the butter. You may not end up with a body butter that’s as smooth, but it should still work. Hi! Also, for the arrowroot starch, is it okay if I use the kind that they sell at the grocery store? Or does it have to be organic? Hey Grace, Yes, any kind of arrowroot is perfect. I made this as directed. Even with the addition of the almond oil I still find the butter to be too oily at first. After 10-20 minutes it absorbs. I love the way it feels after it absorbs. Any suggestions? Hey Deborah, You could increase the arrowroot next time, or you could try adding a bit more arrowroot now if it’s not too hard. Also, with body butter a little bit goes a long way, so decreasing the amount used may also help. 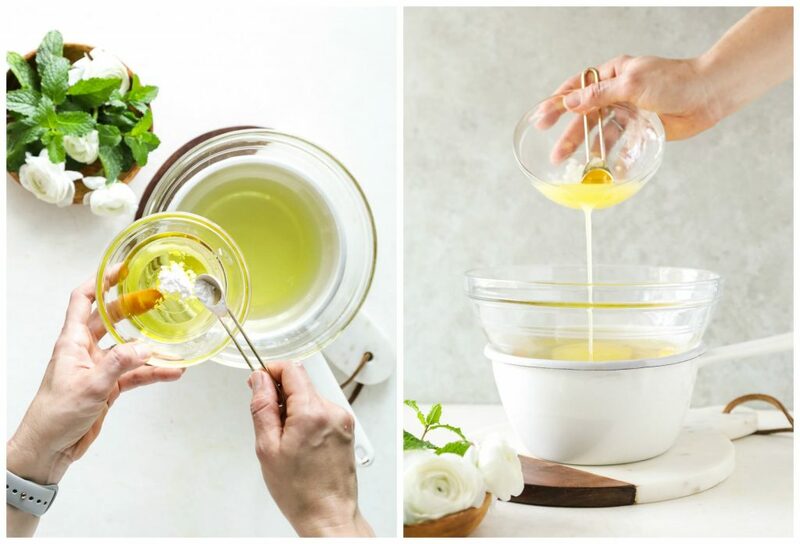 Hi, in your video, it seems that you are adding the carrier oil and the arrowroot powder into the double boiler and in your written instructions, it says to remove the bowl with the butters from the heat and then add the carrier oil and arrowroot powder. Which method do you recommend I use? Hey Grace, You’ll add the oil and arrowroot mixture to the bowl with the melted ingredients. 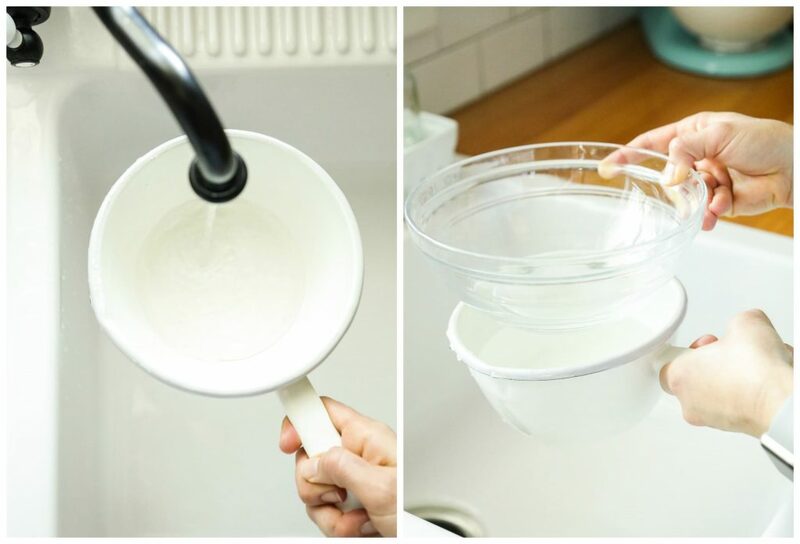 You can remove the bowl from the pot (if you’re creating your own double boiler), or add the mixture while the bowl is still sitting on the pot. Either way, the mixture is being added to the bowl with the melted ingredients. Does that help clarify? Hey Julai, You could definitely use coconut oil or olive oil. Olive oil will feel a bit heavy, and might be slower to absorb, but it will still work well for moisture. I’m so glad you’re enjoying the lip balm! Congrats, Mama! Wonderful recipe. Question, the containers that you show in pictures with the flip suction ring lids. Where can they be purchased from. Hey Char, Thank you. I purchased these from Target (kitchen gadget section). I am wondering about the utensils – bowls, blender etc — are they easy to clean and use for other cooking or do you keep them specifically for making body butters – thanx ! Hey Colleen, I recommend using hot water and a detergent-based soap that easily cuts grease (like Seventh Generation or Sal Suds). They are pretty easy to clean using these suggestions. Could you use beeswax in this in addition with everything else? How much do you think would be good? Hey Anna, You could, but it will make the product very hard. I would add no more than 1 tablespoon. Thank you for sharing , I ABSOLUTELY love this recipe! I used Shea and mango butter with apricot oil (I like how quickly it absorbs) and Baby’sBreath fragrance oil to scent. 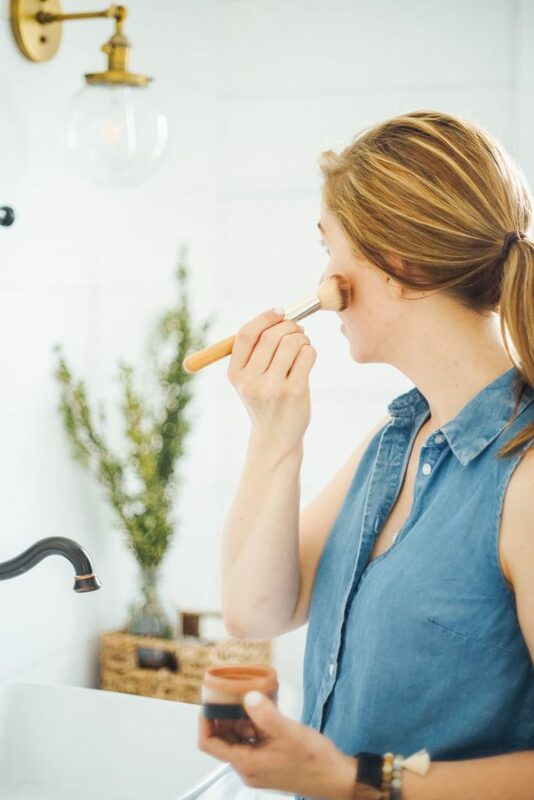 I used just one teaspoon of arrowroot flour and will insrease it next time although after about 30 minutes it no longer felt greasy and left my skin soft and smooth. Already planning for the next batch, going to infuse my carrier oil with chamomile and calendula flowers and use Roman chamomile EO. Yay, that’s great! Thank you for sharing, Stacy! Love your idea to infuse the carrier oil with the chamomile and calendula. Hey Julai, Thank you. Welcome! Yes, you can :). I love your recipes and walking my way through your body care products. Your honey aloe face wash did wonders for my skin (having less luck with castile soap one) I made the body butter last night and it didn’t look as fluffy as yours. Also, the smell of arrowroot is pretty bad. I tried adding more lavender essential oil, but the strange smell is still there. Is there anything that I can do to fix the smell and fluffiness? Hey Sohini, Hmmm, what brand of arrowroot are you using? Usually arrowroot is odorless. And what butter combo did you use? <--The butters used will determine how soft and fluffy the final butter is. The harder the butter, the firmer and more dense the body butter. In the end, the body butter won't be super fluffy in the long-term. Thank you Kristin! I just used shea. I am going to get some mango butter to make it lighter. I saw that yours looked like whip cream 🙂 and wanted mine to look like that. May be the mango butter will do the trick. I used red mills arrowroot. The smell may be coming from the shea itself. Do you have any tips for anything that I can add for a different smell? I added lavender essential oil. Anything else that you can think of? Fantastic recipe and instructions! After letting mine chill in the fridge for approximately 30 minutes and it still hadn’t hardened, I took it out and mixed it anyways. It looks like creamy white soup (and same consistency) but after leaving it for a few minutes, it hardened right up and feels wonderful to smooth on. I halved the recipe (used coconut oil as my carrier) and included arrowroot. 5 stars — thank you for sharing! I made mine with Shea butter and mango butter, almond oil then geranium and lemon for scent. You can still smell the shea at first but eventually the oils overpower it. Next time I will try arrowroot as it is a little more greasy than shop bought butters but it’s easy and works. Thanks for the recipe, I love it. I’m so glad you’re enjoying it, Issie! I am loving this and plan to make. I would also like to use this recipe and make it an immune boosting foot rub. One that has immune boosting essential oils but also feels nice on our feet as well. Any suggestions? Or do you currently use/make something similar? I tried your body butter using shea butter, cocoa butter, and coconut oil, and I absolutely love it! I had no idea something like this could be created at home and for a fraction of the price charged by brands. The cocoa butter actually makes this smell like chocolate, which I’m more than happy about. I added two teaspoons of arrowroot and experienced no greasiness on my skin. I found that cooling the mixture in the freezer instead of the fridge made it easier & quicker to whip. After this successful attempt, I’m going to definitely try out your lip balm next. Thank you! Will this melt in the summer time at all? I have never made any kind of beauty product before and this recipe made me feel like a goddamn CHAMP. Super easy to make with great results. I used mango butter, sweet almond oil as a carrier, arrowroot and lavendar oil and it absorbs nicely into my skin after about 10 minutes. I cooled my first batch in the fridge but it took over an hour and got a little grainy. I cooled my second batch in the freezer and used a hand mixer and it turned out much smoother. i am a beginner and am trying to create my own body butters. i have a recipe that i have substituted butters and oils to make it what i want. but i am stuck when it comes to ratio of oils to fragrance oils and also how do i turn a recipe from a small amount “say a 40z jar” to a large amount to supply “6 2.3oz smaller jars” . i have tried looking for books but cant find the right one with a good explanation. I really love your recipe very in-depth and detailed. and some great scents choices. What does the arrowroot do? What is the difference in using it and not using it? Hey Alaina, It makes it less “greasy” when applied to the skin. Just made this recipe. Quadrupled it and substituted 1/4 of the almond oil with argan oil. Didn’t chill long enough so put in freezer and VOILA! Now that it’s done, how can I add the arrowroot after the fact? Just a little greasy, but does soak right in. I make a similar recipe as a facial moisturizer that uses beeswax, but does not use any starches. It is “greasy” going on, but I let it sit on my face for about 10 minutes or so, I use that time to get my clothes out for the day and pack my lunch. Then I take a clean dry cotton washcloth and gently dab any remaining oil (if any) before I apply my make-up. I’m 57, so I use essential oils in my moisturizer, such as frankincense and lemon, that are known to help aging skin. I am excited about trying your body butter recipe! I do not plan to add the arrowroot but use my towel that I showered with to pat off any excess oil.